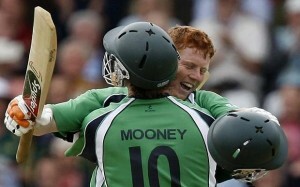 Ireland defeated England in the group state match of the ICC World Cup 2011 held today in chinnaswamy stadium, Bangalore, India. Ireland has scripted history by successfully chasing down 328 runs thereby becoming the first nation to make such run chase. Boy, i dont know where to start. I am thrilled to the core. Kevin O’Brien and Alex Cusack are the deserving candidate to be praised. Both the cricketers have scripted their names in the history of Cricket. Kevin O’Brien became the first man to score a fastest hundred in the world cup history. He scored 100 for just 50 balls. Holy cow! Thats just brilliant. The match started with England elected to bat. The England batsman didn’t disappoint as they whack the ball all over the ground. Trott, Pietersen and Ian Bell scored a marvelous half centuries taking the England score to 327 for 50 overs. In reply, the Irish started the innings very badly as they score very slowly and wickets going down regularly in the other end. At one stage, Ireland were 111 for 5 in 24.2 overs. When everything seemed lost, there came a hope for Ireland with the coming of Kevin O’Brien and Alex Cusack. Man, they batted superbly. Hats off gentleman. Kevin O’Brien scored fastest century in the world cup history taking out Matthew Hayden of Australia. He scored 100 runs of 50 balls. Alex on the other end played a sensible 47 runs before getting run out. The match then became very interesting as the new batsman John Mooney played a sensible innings along with Kevin O’Brien. When all seemed set for Ireland, Kevin got run out when the Irish score was 317 for 7. In the end though, the day belonged to Ireland as they scripted history today. Girl Robbed for 68p in UK! Next: Selena Gomez Punched for Dating Justin Bieber ?? Melissa Benoist Donned as Supergirl! FIRST PHOTO! Plan to Kill Justin Bieber Foiled? how the biscuits began- An History visited!